What is it that they say about smog? Oh yeah, beautiful sunsets. Make L.A.’s haze work for you at these cocktail bars and beachside spots, where the views rightfully rival the booze. From Downtown’s bars with stellar sights to seaside cabanas in Malibu and Venice, here are the city’s top (literally) rooftop bars. Above SIXTY provides both a name and directions to this exclusive hotel bar. Open to Sixty Beverly Hills guests, members, and cabana reservations during the day, this ritzy rooftop lounge is open to the public for a swanky bar crowd at night. The rooftop lounge offers wine, beer and “sunkissed cocktails” such as the Strawberry Smash, crafted with vodka and fresh muddled strawberries. Appetizers and meals, including kale chips and avocado toast, are also available on the roof of the sleek hotel, as are occasional weekend pool parties. You’ll pay a pretty penny for your libations, but it’s worth it for the view. The Freehand Hotel’s trendiest clientele are like moth to flame at the quirky, colorful and palm-laden rooftop bar above DTLA. Cool off with eclectic cocktails—with some equally eclectic and colorful garnishes—served from the thatched-roof bar as you snack on street-food-inspired dishes. (Don’t skip that guac with peanut salsa.) It’s a perfect perch to take in views of Downtown, especially around sunset. Overwhelmed by that brief but fun menu? We’re crazy for the Carrot Colada, made with gin, montenegro, carrot-and-coconut orgeat and a pink peppercorn cordial. Beachside rooftops are in surprisingly short supply in L.A., making Hotel Erwin’s High Rooftop Lounge an in-demand spot for sun-kissed Venice Beach locals. Even if you’re staying at the hotel, be sure to make a reservation; there’s nothing like a multi-hued sunset over the Pacific with a cocktail in hand to get Angelenos buzzing. Getting chilly? Evening bar-goers can wrapthemselves in one of the bar’s cozy blankets, along with a spiked cocoa or hot root beer float. If you don’t like your drinks sweet, stick to local craft brews to pair with munchies like gourmet sliders and street tacos. The Nomad Hotel rocked LA as one of 2018’s biggest openings, and between the lobby and mezzanine restaurants, you probably thought that was all they had to offer. Wrong. The newly opened rooftop bar is wonderful, featuring a menu full of Nomad-quality stuff; all the cocktails, beers, wines, and frozen drinks you could ask for are available, as well as tasty bites (shout-out to those scallops), and there’s even a whole section of non-alcoholic cocktails. There are rooftops, and then there’s Spire 73. This open-air hotspot is, you guessed it, 73 stories in the air, and an absolute titan of the DTLA scene. Clocking in at over 1,000ft, the Wilshire Grand Center is the tallest building west of the Mississippi (seriously), and that makes Spire 73 — part of the building’s InterContinental Los Angeles Downtown hotel — the highest place to grab a drink in LA. The views are breathtaking (literally — you’re 73 stories up), and there isn’t a single piece of LA you can’t see. This longtime local favorite rooftop somehow still feels like a hidden treasure: the pool is beautiful, the food at its classic-American restaurant is delicious, the garden calming, and the bars (there are two) thirst quenching. If you’re looking to dine on the roof, note that you’ll have to reserve a room first — actually, maybe that’s why this treasure feels so hidden? It’s confusing which half of this two-story restaurant/bar is EP and which is LP, but it doesn’t matter: everyone calls it by both names, and everyone’s happy when they end up on whichever one is actually the rooftop, which has great views, fire pits, amazing cocktails, and small-bite Asian food from EP downstairs. Er, LP downstairs. Er, from the downstairs kitchen. Yeah, this Downtown restaurant’s got one of the best views in the city, but did you know one floor above is a bar with EVEN BETTER-ER VIEWS IN THE CITY? And the drinks are so good, you guys. Try a Spicy Concombre w/ Greenalls gin, St. Germain, lime juice, cucumber, and jalapeño. Alternatively, you can grab yourself a $6 Scrimshaw, or a $7 Stone IPA. And psst, they’ve even got a late-night menu, including ahi tuna tartar and burgers. 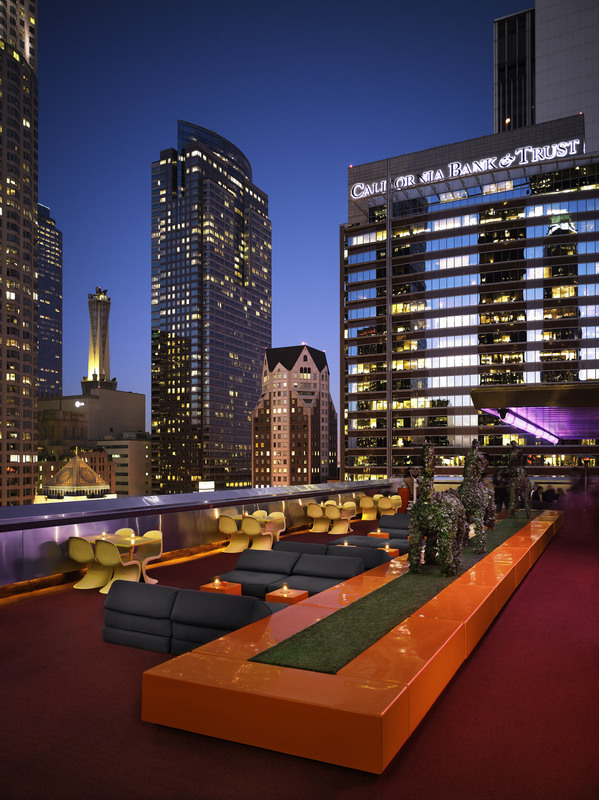 Now, what would an L.A. visit be without a rooftop bar at a boutique hotel? Mama Shelter fits the bill: vast views of the city (and Hollywood sign), colorful decor complete with throw pillows and lounge chairs, and Instagrammable food. The rooftop restaurant just opened earlier this year, so you know it’s on point. With a biergarten, a DJ and even waterbeds, The Standard in downtown LA is not a spot to miss. Lots of fun to be had here and even better cocktails. Definitely a fun spot to hit on a weekend night.